I have been thinking a lot about what is necessary to ensure that universities are committed to equality. You and your staff need to ensure that equality issues of every type are factored into every decision made. This might sound ridiculous. But compare finance. Finance is factored into every decision at this university, as it obviously should be. If we don't factor equality into every decision in a similar way, then decisions that hurt equality will inevitably result. I have picked out seven particularly important equality issues which your university faces. Are you prepared to address these problems? What is the gender pay gap at your university? For example, if you are my former boss and now VC of Oxford, the headline hourly pay gap is 24.5%, i.e. women earn about 75.5p for every pound men earn. Turn it around and men earn 34.2% more than women. And this understates the problem. Women are far more likely to be part time and therefore on an annual pay basis the gap is probably much worse. For example, by my calculations at the University of St Andrews, the headline pay gap was 21% in 2017, yet the same data shows that men earned 38% more than women per year. 3. Casualisation and early career precarity. The path to a stable academic career is a fraught one, and fundamental to equality. Some good steps have been taken here, such as bridging funds for teaching and research staff. But much more needs to be done. It is a particularly vital equality problem because those from disadvantaged groups are less likely to be able to surmount the obstacles the academic career structure puts in their way. I was recently amazed to discover just how inaccessible universities remain in general, and how much disabled students and staff have to fight to get even "reasonable adjustments". While not my area of expertise, it is completely clear that the disabled community views university culture as ableist in many ways. I'm told that the notional working hours of academic staff is 37.5 hours per week, although I’m not sure if that is the correct number. As a good employer, it is this university’s responsibility to ensure that this is not a notional working time but a real one. What is the university going to do to ensure that in future the contracted hours are all that staff are expected to work? Not to act in this area puts at risk the health and careers of those who are unable to work more than the notional amount, e.g. those with caring responsibilities such as single parents. This could be a form of discrimination. 7. Use of language and communications. Do you believe that you are the kind of academic we all aspire to be, who accepts criticism perhaps grudgingly but definitely gracefully? Yes? Great. Do your staff believe you? Are they sure that criticising you, your decisions, or your senior management team (SMT) will not harm their careers? If your staff have the temerity to do something you don't want them to do, such as for example striking for better pensions, are they confident that their next promotion case will be looked on just as well as any other staff member? I'm sure you are confident that you can give all the right answers. If you're at a USS institution, there's a very good chance your staff disagree with you, especially if your university told UUK that your staff don't deserve good pensions, or that staff who took ASOS deserved anything down to zero pay. Why not find out - commission an independent staff survey to find out what they think of you and your communications with them? Then - if the results are not what you hope for - make sure that you completely reform the way you and your SMT communicate with staff. Deadline Extension Request: Open Letter to Chief Executive of EPSRC. I write to you as Chief Executive of EPSRC, and ask you to immediately make sensible deadline extensions to EPSRC closing dates. This is of course because of the disruption across the University sector. For example, given the strikes to date, a blanket extension of two weeks to all deadlines within the next month might be appropriate, but I naturally leave the details to you. Fewer and lower quality submissions to EPSRC calls than you have a right to expect. Stress on staff at affected institutions under pressure (both from others and themselves) to do the right thing in their view by striking but also to obtain funding for the benefit both of their employer and their career. Overwork at danger to their health by staff who are committed to both strikes and submitting amazing proposals to EPSRC. Potential conflict between staff at a striking university between collaborators on a grant taking different stances. Potential conflict between staff at different universities collaborating on proposals, where one is striking and the other is unaffected (e.g. a post-92 university). By making an appropriate extension urgently, EPSRC would not be taking any position on the strikes except that they are happening and are having a massive impact on the work of many thousands of staff. I believe that such a blanket deadline extension would massively foster goodwill across the sector. While I deeply disagree with the management at my university about the strike, I do want to emphasise that I have come under no pressure at all from anyone at the University of St Andrews to change my stance because it might help the university obtain such a large grant, and I thank everyone involved for that. As an instructor and academic at St Andrews I have never put money over my students or my work. I've sacrificed much of my personal time for the quality of my lectures, practicals and supervision, often working off hours and weekends. In my calculation, I've (happily) overworked to the tune of about 10 to 20 extra hours a week on average, and systematically failed to take all my holidays. I'm not alone here, a large proportion of my colleagues do the same, helping deal with the increasing work load that we have been observing in the last few years. But the University and UUK now seem to be asking us to, besides the years of increased load ("we have to do more with less", as put by the Head of School) and of lower-than-inflation increases, put in jeopardy a reasonable retirement and make us take most of the risk, without any compensation for that loss, and with weak arguments as to the whys or hows of the situation. Just the fact that UUK has allowed the industrial action to happen, forcing us to go on strike is, in itself, a great disappointment and it has been even more disappointing to see that St Andrews has been one of the institutions vocally defending this position. The previous principal, Louise Richardson, put it quite eloquently at one of the meetings I attended when she was the principal. She expressed that if she had to make a career decision at the current time (a few years ago) regarding being an early career academic, she would probably do something else. Well, for me it is becoming more clear that, were I to accept the new retirement plan, I would simply be accepting the chance that my retirement would not be enough for me and my family to sustain a decent life in the mid and long term (I'm not talking about luxury here). I cannot accept that risk on top of a salary that, quite frankly, is quite low compared to colleagues of similar standing in similar countries, and an increased workload. I realise that this is not only the fault of the University or UUK. Successive governments and the overall direction of the country all seem to be conspiring towards transforming this country's higher education sector into a money making machine at the cost of the employees' financial security in old age. But instead of trying to ameliorate the effects, the University and UUK seem to have other priorities and be ready to pass on this enormous cost to us. I love my job, I love my colleagues, I like St Andrews as an institution. St Andrews has been welcoming to me and offered much opportunity, contributing to my professional development. I am ready "Ever to Excel". I am ready to continue the virtuous cycle of good will and keep putting into the job my 130% percent, but not if I feel short-changed by the institution's management and a fair pension is not prioritised. Perhaps the University of St Andrews has overlooked our situation and taken for granted this good will, from my colleagues and I, that is most likely one of the factors that keep the university in such high regard and at the top of the rankings. Many of us have other options. I want to stay and this is why I am on strike. However, without a reasonable pension that will help me sustain my family I will just try to go elsewhere where the best and brightest of my colleagues are going, especially in these Brexit times, and where I can have better prospects for a retirement remotely comparable to the kind of retirement that my most senior colleagues are getting now. Postscript: Many thanks to this person. Two quick reactions. First, just as with those who post on Depressed Academics or talk to me in person, I am deeply honoured and moved by the trust that people place in me. Things like this are not always easy to say and the fact that people believe I am the kind of person they can say them to means an awful lot to me. Academia is about lots of things but it is at its best when it is about companionship and collegiality. A few moments ago I resigned from the University of St Andrews' Equality, Diversity and Inclusion Committee. Here is my email to the Principal explaining this decision. I write to you for three reasons. First, I write to thank you for your change of position on ASOS deductions. I completely agree with this decision and you deserve full credit for changing your mind and the University position on it. Second, I write to urge you to move urgently to help resolve the current pensions dispute. It is entirely clear what the University community's view is, so I would urge you to follow the lead of many others, including (moments ago as I write) our former colleague Louise Richardson, and reverse the position of the University. Third, I write to resign as a member of the University's Equality, Diversity and Inclusion (ED&I) Committee. Too many of us, including me, have failed to "speak truth to power". I intend to correct this mistake in the future so will start now. I do not doubt your personal commitment to equality and sincerity of your efforts to enhance it in St Andrews. But the truth is that your efforts to make this University a beacon of equality are doomed to failure without a dramatic change of approach. In your email of Monday you said that it is up to the University community to decide our priorities. The University community has been making this choice for 605 years and for every one of those years has decided that equality is not a high priority. Yet it should be no more up to the community to decide that equality is a priority than it is for the community to decide that we should care about fire safety. Equality is a legal and moral imperative that must underlie every decision made in the university, just as (quite rightly) financial imperatives already do. Pensions are an equality issue. Changes to pensions are likely to differentially detriment workers such as lower paid staff, casual workers, part time workers, those who have taken career gaps, all categories of immense concern in themselves and also more likely to be women than men. Yet the pensions issue has not been discussed in any way by the ED&I Committee. The University should not have considered writing a response to the UUK consultation without consulting this committee. When the University has an ED&I committee that is consulted on key equality issues and whose opinions are listened to, I will naturally be happy to serve on it. I pay tribute to all the amazing work done by so many talented people in the area of equality at this University. Many of them are colleagues from the ED&I committee and will feel that it is right to continue working on that committee, and I will not attempt to change their minds. But for me, it is a relief to stop the public pretence that all is well in equality at this University, and that we have any hope of achieving meaningful equality without a dramatic change in approach. Note added 5pm same day: been rushing around all day but wanted to be sure to do two things. Credit to Mark Pendleton for the phrase "pensions are an equality issue"
And separately wanted to emphasise that my decision is in no way an imputation of bad professionalism or commitment on behalf of the E&DI staff at St Andrews. 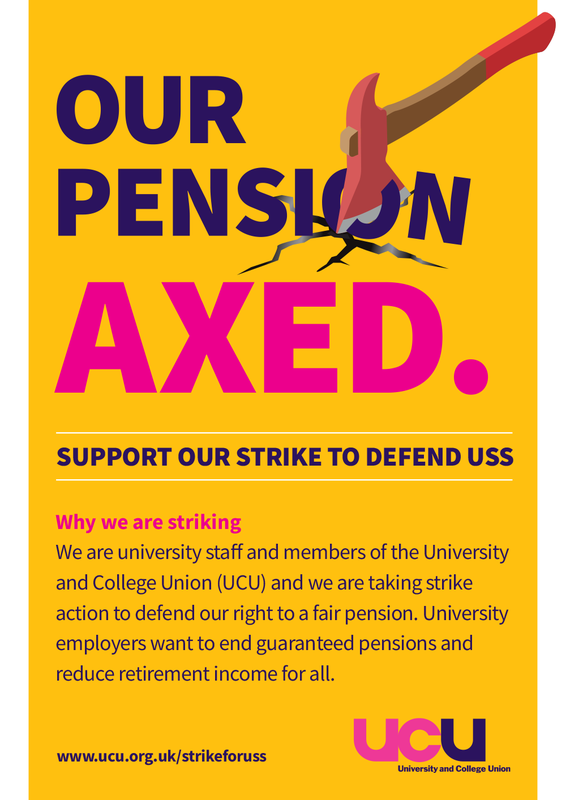 This post is inspired by, not as good as, and much much longer, than: a wonderful post by Kate Cross about why she would encourage everyone to strike in the current UCU-UUK pensions dispute. Feel free to just read that one instead. Or even just watch this amazing minute of her speech in Dundee a few days ago. Being on strike for a couple of days has given me a bit of time to read more about the situation. I always thought a strike was the right thing to do, but I am completely surprised at how strongly I now feel. This is because I've been following what's been happening and have been shocked by what I've found out. In some cases these have been out there a while and I only now know about them. In others things have come out recently. So here are the things that have made me ever more certain that striking is the right thing to do. Please join me. I really really wanted to put in all the links to justify everything, but eventually it got too late on Sunday night. Feel free to query me about anything. University salaries will rise 1% above RPI, i.e. 1% above inflation. I can't remember our most recent pay rise that even matched inflation, never mind went above it. At a guess it was before the crash in 2008. Life expectancy will increase by 1.5 % per year, when if anything they are declining. This assumption was so absurd that when somebody challenged the online pensions model based on this, they changed it to 0.5%. One of those for that option was Cambridge university, which declared that it was not the official position of the university because ... I don't know, I suppose they couldn't be bothered. Several others were individual colleges at Oxford and Cambridge, who were treated as equal voices with all other universities in the system. One estimate was that about a third of the 42% came from Oxbridge alone. USS is doing really really well. How badly has USS been doing over the last five years? 12% a year. Wow. It's been falling by 12% a year?? Incredible. No wonder there's a problem. No, sorry, I misled you. It's been growing by 12% per year for five years. Growing. That's how well it's doing, even though apparently it's headed for catastrophe. And another metric of how well it's doing is the news, discovered on the first day of the strike, that the boss of the USS received an £82,000 pay rise precisely because the USS is doing so well. Just take care to read that right, the rise is £82,000. On Friday, the UUK (employers organisation) announced that they wanted to resume talks. Excellent news. Except ... they are not prepared to discuss the key issue of reverting the decision which led to this strike. Which they didn't want to reveal but I found out when the University of St Andrews accidentally forwarded a private email to all (or at least many) staff. Or take this headline from a left wing rag: "Vice-Chancellor suggests he deserves salary of £360,000 as he has to oversee huge staff redundancies". Oh wait, that was the Daily Telegraph. When the Telegraph is mocking employers in a dispute in their headlines, you know how ridiculous they employers are being. You might think that the union position is pie-in-the-sky everything-is-fine don't-touch-it. Not at all. If the universities suddenly agreed to the union position, we would get pensions that we had to pay for more and then delivered us less. We are striking for a worse pension, against the alternative of a pension which puts all the risk on staff. And the more the employer position is that the current scheme is unaffordable, of course the more their arguments confirm that they are seeking to massively reduce our quality of life in retirement. I never used to mind the extremely high salaries university principals get. Indeed even now I don't think the money a principal or a vice-chancellor gets is a problem. But there is a very big problem, which is that failure as a principal seems to attract very high rewards. I think my former boss, now vice chancellor at Oxford, is a wonderful case in point. I thought she was a pretty good principal and people weren't rude about her while she was here. But on the other hand, the number one goal of her tenure was fundraising around the 600th anniversary in 2013. And she had the most wonderful free gift at the exact start of the campaign, of William and Kate getting engaged. And the campaign was an ignominious failure. She set out to raise £100 million between 2011 and 2013. It's so far raised £90 million, which doesn't sound bad except it's now 2018, so about 13 million a year instead of 50. And that failure led to her getting the promotion of the job in Oxford. And a complete inability to defend on the radio her £350K salary or remarks about homophobic professors. What decisions does a University principal make that matter very much to the future of the University? This is a serious question, because I have no idea. The two main drivers of university income are teaching and research. Both of these are driven overwhelmingly by forces outside the management's control, and most especially by the quality of staff and the work they do. University principals are not good value for money. And given the money they earn, that's a very big problem. I don't want to beat down too much on our current principal, but a couple of points in the letter she sent to staff are symptomatic of the disconnect between the presentation of the situation and the reality. She mentioned that the University runs a small surplus. I'm sure that's true, but let's remember: the University of St Andrews is a charity. It's legally required to run a small surplus instead of a big one (and hence the word surplus, not profit). So if we are making too much money, we have to either spend it or put it against the balance sheet in some other way (like incurring debts for planned things like the move to Guardbridge and a new STEM building). It's not an accounting trick to say we have a small surplus, but the word "small" is meaningless. (I'm grateful to the person who made this point to me but I don't want to embarrass them by naming them - if it would embarrass them. If not I'm happy to edit and credit them). She also mentioned that the consequences of preserving our pensions would be increased class sizes. But ... A) what is apocalyptic about increased class sizes? And B) as everyone in Computer Science knows, our class sizes have ballooned in recent years due to CS being such an awesome subject and us being so awesome at teaching it. Does that mean we get to keep our pensions after having already suffered whatever the cataclysm of increased class size is? No, of course not. Though I'm striking, I am not seriously worried about my own pension. I have a large percentage built up on the prior rules, live in a dual-income family, and I have a high salary (and indeed got a significant pay rise last week: long story, happy to talk to you separately about that one if you want). But I worry a lot about younger colleagues who don't have these advantages or only some of them. The online pension calculator is seriously scary for young staff, and they need my support. (Thanks to Neil Davies for doing that). The entire point of the pension change (and there is no argument about this from either side) is to de-risk pensions for the universities and put the risk onto the staff getting pensions. But academic computer scientists are not notably risk-loving people. In general many of us are here in part because we like a safe environment which we know and which - while not giving us the rewards of outside jobs in our field - is a very rewarding one with a decent pension. Take away the second half of the deal and the equation for staying changes against academia. Everybody in the School of Computer Science is incredibly smart and talented. Many of them (and yes that means you if you are reading this) have better reasons than me for leaving academia: they are better programmers so would find it easier to get a job; they are paid less than me so need to find a less high paying job to be attractive; they are younger than me, so have far more to lose in the pension changes; and are not all living in the same country they grew up in so have far less reason to stay in a place which Brexit has already made a less comfortable environment for them. So to all of them (and you) I say this: if these changes go through and you decide to leave, then I'll be sorry, I'll miss you, but I won't be able to say you made the wrong decision. I want to tell you about the 5 million pound grant I'm not writing today. I'm not writing it because I am on strike against my employer (the University of St Andrews) and more generally many universities in the UK, because they seek to destroy part of the informal social contract between themselves and their staff. That contract is: undertake work for decades at the forefront of your field, and we'll look after you in retirement. They've now said that they don't want to look after me - and most especially my younger colleagues - in retirement. The result is that today I am not undertaking work at the forefront of my field. Work that could bring in £5 million or more into the University. So what is the grant I'm not writing today? You may have heard that Artificial Intelligence (AI) is the hot new thing. It's so hot that at very short notice the government has decided to fund 10 to 20 centres at about £5 million each to fund 50 PhD students in AI each - yes that's funding for about 1000 PhD students. Short notice? The call was announced two weeks ago and has a deadline in 5 weeks. Seven weeks in the world of putting together this kind of bid is a nanosecond in academic time: I heard last week about a bid where it took about a year of negotiations at principal-level to decide which university was going to lead a multi-site bid. I love AI. I've been studying it well more than half my life, and in fact half the life of the subject. I started studying AI in 1986, and it was founded (by one count) in 1956. I've published 8 papers in the top journal in the field, and another 5 in the second best. My "h-index" is 43, all papers about AI. I only mention these numbers to show that I am quite good at working at the forefront of my field (and yes, full disclosure that's the British "quite" which actually means "very"). So exactly the kind of person you would want to lead an application for a £5 million pound funding bid. With three working weeks taken out of seven weeks to prepare a bid, it would be no surprise if we could not write the bid on time and lose any money we might have got. So why am I telling you this? To correct any impression that the only people strikers are hurting are current students. I am potentially hurting myself. Because I might not be able to bring 50 PhD students into the field to share the passion I have lived for so many years. I am potentially hurting my colleagues throughout the University of St Andrews. Colleagues who I can help to get funding to have their own PhD students in AI. Colleagues whose future might be transformed by working with those students. I am potentially hurting those future students who won't get to study AI at this wonderful university with 600 years of history. I am potentially hurting this wonderful university's finances by endangering a million pounds a year of income, roughly half a percent of the university's budget. And actually I'm not hurting current students very much at all. I might be missing some lectures and tutorials, but when I asked my Head of School yesterday if he would prefer (after the strike, if a choice was necessary) to prioritise helping those students catch up or get this grant, he immediately said the current students. I admire this and it's obviously right. I don't want to give any impression that I am trying to hold anyone hostage with this. I think the chances are we will be able to put in a bid, and also I have gone out of my way to make sure that I don't stop anybody else working on the bid. But on the other hand, I do think that my own and other universities are jeopardising the future wellbeing of their staff. This has to be stood up against, and that means striking. Recently my department - the School of Computer Science at the University of St Andrews - has been interviewing candidates for lectureships. Each candidate had to give presentations to the School. It dawned on me during the talks how different things were when I gave my talk which helped me get my lectureship here. I've been telling everybody two stories about that talk. The first was that during the talk I said something like: "This is not just an academic question, people all over the world care about this." And then I thought for a moment and paused before saying "Well now I think about it, they are all academics, so actually it is an academic question." This wasn't a prepared joke, but apparently I got away with it. The second relates to the point about things being different now. I didn't have to do a sample teaching talk. Years later, when the School started requiring candidates to do that, I said to my boss (Ron Morrison), "I never would have got my job if I'd had to give that talk." Quick as a flash, Ron shot back: "Why do you think we brought them in, Ian?" A great line, especially assuming (as I hope) it was a joke. I went and found my talk - which is still on my computer - and it turns out ... that yes, things were very different. My talk was called "The Importance of Being Flawless". Here it is for your delectation. Boy, were things different then. This is basically just a research talk which might have been a research seminar. I'm pretty sure that was standard then: I mean it got me a job, right? And it was my second lectureship, not my first, and the previous one was similar. So no teaching talk, just a seminar about one small piece of work instead of giving a vision for how I was going to revolutionise the field, not waffle about how perfectly I would fit into the department, no list of grants I was going to apply for, no suggestions for new modules I could introduce, and no suggestions for existing modules that I was desperate to teach (preferably ones that nobody else wants to teach). In short, this isn't a talk that would get anybody a lectureship now. That doesn't automatically mean that things are tougher now, just very different. I mean, Computer Science was a smaller discipline then so there were less jobs to go around, although there were also fewer people chasing the jobs. Though in fact yes, I do think it's tougher now to get a lectureship in CS now than it was then. The amazing thing that hasn't changed - actually is far more true now than then, was the title of the talk. By coincidence, my talk had maybe the most appropriate possible title for a modern lecturer candidate: "The Importance of Being Flawless".